1 Organic Plush Toy, 2 Organic Swaddle Blankets, 1 Organic Convertible Gown/ Romper, 1 Organic Cap, 1 Pair of Gucio Shoes. We can't put together such an incredible gift basket at such an incredible price without including a little treat for mommy too! All gift baskets include an old fashioned ice cream parlour style bag of organic artisanal candy from Yummy Earth. 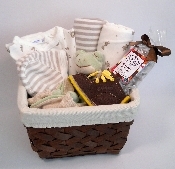 All gift baskets are configurable and can be made to order. Simply contact us and we can create your heart's desire.